To correlate prostate-specific antigen (PSA), free to total PSA percentage (fPSA%) and prostatic acid phosphatase (PAP) levels from peripheral and pelvic venous samples with prostatectomy specimens in patients with prostate adenocarcinoma and borderline elevation of PSA. In this prospective institutional review board approved study, 7 patients with biopsy proven prostate cancer had a venous sampling procedure prior to prostatectomy (mean 3.2 days, range 1–7). Venous samples were taken from a peripheral vein (PVS), the right internal iliac vein, a deep right internal iliac vein branch, left internal iliac vein and a deep left internal iliac vein branch. Venous sampling results were compared to tumour volume, laterality, stage and grade in prostatectomy surgical specimens. Mean PVS PSA was 4.29, range 2.3–6 ng/ml. 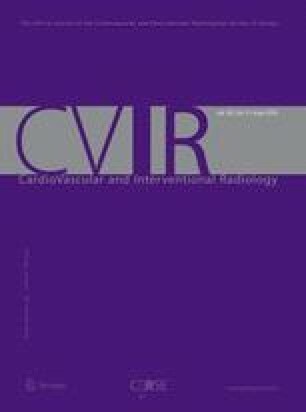 PSA and PAP values in PVS did not differ significantly from internal iliac or deep internal iliac vein samples (p > 0.05). fPSA% was significantly higher in internal iliac (p = 0.004) and deep internal iliac (p = 0.003) vein samples compared to PVS. One of 7 patients had unilateral tumour only. This patient, with left–sided tumour, had a fPSA% of 6, 6, 6, 14 and 12 in his peripheral, right internal iliac, deep right internal iliac branch, left internal iliac and deep left internal iliac branch samples respectively. There were no adverse events. fPSA%, unlike total PSA or PAP, is significantly higher in pelvic vein compared to peripheral vein samples when prostate cancer is present. Larger studies including patients with higher PSA values are warranted to further investigate this counterintuitive finding. Grant Support: Study supported with a seed Research Grant: F. Hoffmann- La Roche Ltd. (Roche Diagnostics). 15,000 US Dollar Grant. This study was funded by a 15,000 US Dollar seed research grant from Roche diagnostics: F. Hoffmann- La Roche Ltd. Author A declares no other potential conflict of interest. Authors Priti Lal, Micah M. Watts, Catherine Mc Gorrian and Thomas J. Guzzo declare that they have no conflicts of interest. Author Scott O. Trerotola declares grants from Vascular Pathways, personal fees from Bard Peripheral Vascular, personal fees from Orbimed, personal fees from Teleflex, personal fees from Cook, personal fees from WL Gore, personal fees from Lutonix and personal fees from Medcomp. These are all outside the submitted work, and there is no conflict of interest. Author Gregory J. Nadolski declares grants from Guerbet, LLC. This is outside the submitted work, and there is no conflict of interest.